You can upload and view videos that you've captured with iShowU, iShowU HD/HD Pro on online streaming video hosting sites such as YouTube, Vimeo, Blip.TV and shinywhitebox's own One Click Publishing service. 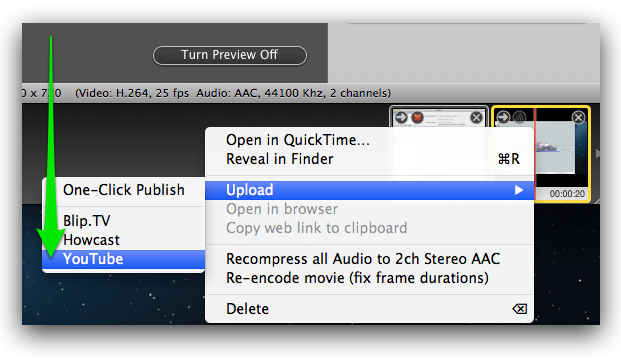 If you're using iShowU v1, you will need to upload the videos to YouTube via your browser. YouTube recommends a 16:9 ratio and a maximum resolution of 1280 x 720. You can now however upload pretty much anything and YouTube will convert it. Some users have experienced issues uploading to YouTube. The symptom is either that you get a "Failed to Encode" message from YouTube or that you hear only a single audio channel. 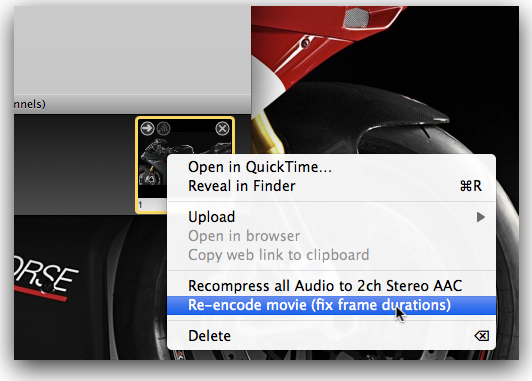 To fix this, please use the "Fix Frames" feature within iShowU HD to re-encode the video. In all cases where we have tried this at SWB, it's resolved the issue. There is no sound when I upload to Youtube? Why does it take over 1 hour for the Video to Composite?